"The man with the golden gun is ready to assassinate James Bond." 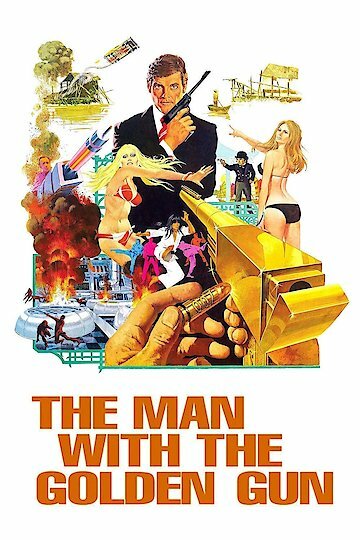 Roger Moore returns as MI6 agent James Bond in the ninth film in the series, The Man with the Golden Gun, also starring Christopher Lee, Britt Ekland, Maud Adams, and Hervé Villechaize. A bullet arrives on M's desk inscribed with Bond's 007 number, a golden bullet, the trademark of a hired assassin named Francisco Scaramanga (Lee) who always uses a golden gun and bullets in his kills. In the midst of the energy crisis Bond is removed from his current assignment, pursing a missing scientist believed to have invented a solar cell that is incredibly efficient. Ostensibly leaving for a vacation in Beirut, Bond is actually attempting to track down Scaramanga through his recent kills. Finding himself in Macau and having found the bullet's manufacturer, accompanied by the charming agent Mary Goodnight (Ekland) he finds that Scaramanga's mistress (Adams) sent the bullet and that the killer also has the missing solar cell. Now locked in a deadly game of cat and mouse on the man with the golden gun's secret island in the China Sea can Bond make it through in one piece, rescue the girl and get the solar cell? The Man with the Golden Gun is currently available to watch and stream, download, buy on demand at Amazon Prime, Hulu, EPIX, Amazon, Vudu, Google Play, FandangoNow, iTunes, YouTube VOD online. The actor died in Switzerland after an illness.